"The reason why I suggested Izzy to join in on the gig is obvious. I was, and remain, a huge fan of Izzy as well as his brilliant songs. The best L.A. 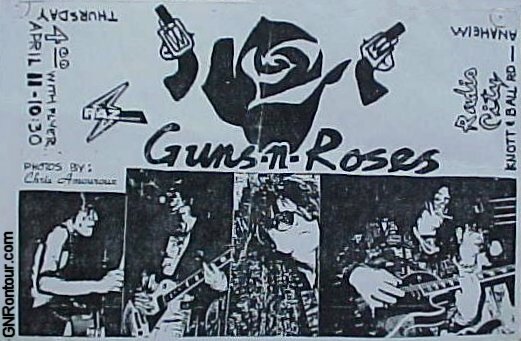 Guns songs were written by Izzy and Axl, with some contributions from others. Also, I thought he might give Tracii some sorely needed help in the song-crafting department. Another important factor, both Axl and Tracii held immense respect for Izzy, and not just because he's almost as cool as Fonzi. Plus, ever since Axl escaped Indiana in search of Izzy in Hollywood, those two were destined to take their shot at the big time together. If Tracii wanted Axl to be his singer and put it all together in a show to last forever, eventually Izzy would join together in their band. It's Izzy's world. Axl and Tracii were just rocking in it." Well, I’m not gonna lie. I love this quote. Does he write more about Izzy than that? There are actually quite a couple of quotes about his creative inpute in the band. My opinion about him changed a lot after reading the book. I'm still a huge fan of Richard, but the whole band history wouldn't be possible without Izzy. 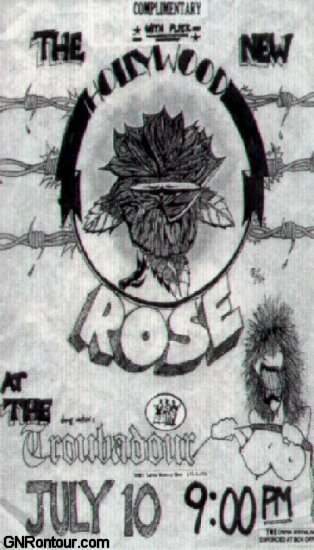 notes: This band is "Rose" - Axl, Izzy [lead & rhythm guitar], Chris Weber [lead & rhythm guitar], Johnny Kreiss [drums] & Rick Holland [bass]. 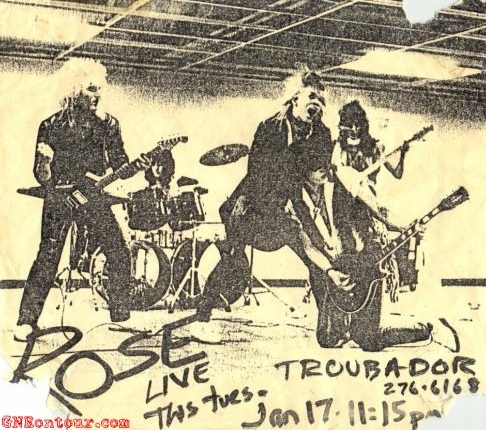 From what we know, this is Axl Rose's first show in L.A.
notes: This band is "Rose" - Axl, Izzy [lead & rhythm guitar], Chris Weber [lead & rhythm guitar], Johnny Kreiss [drums] & Rick Holland [bass]. 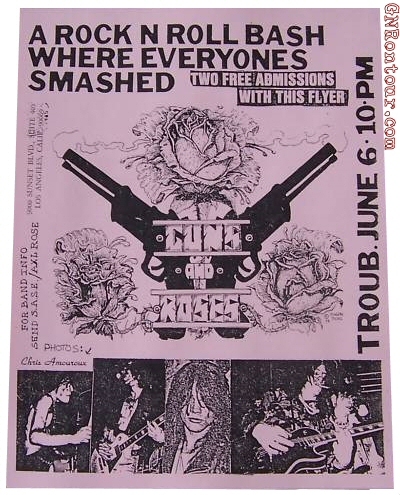 Although the flyer says "Hollywood Rose" - this band is still "Rose" - Axl preferred the name "Hollywood Rose" and had these flyers printed. 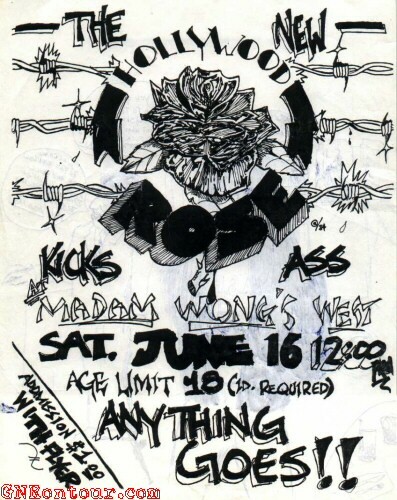 notes: A Hollywood Rose gig. notes: I'm pretty sure that Marc Canter recorded the audio of this show, not sure if video too! notes: is this the first L.A. Guns show??? If so, Axl doesn not join L.A. Guns, but is indeed the original L.A. Guns singer! Audio/video recordings: Marc Canter recorded this show! audio/video recording: i dont know for sure, but my sixth sense (and the pictures on his book) tells me Marc Canter recorded this on video! Now, we know for sure Axl played the two shows in october and then left, according to Marc Canter's book. Recordings of these two shows should exist and in the hands of Marc Canter. The rest of the shows, I guess Mike Jagosz took Axl's place, after the infamous Axl/Raz fights over something that either happened at the Rainbow or something. Around this time, the idea of Guns N' Roses is discussed between Axl and Tracii. This confirms that it was not a disagreement between axl and tracii to end this partenership in L.A. Guns (otherwise they wouldnt have formed guns n roses together just a couple of months later). If someone can fill in, or confirm this infos, please join in! Now, we've seen that in january and february of 1985, L.A. Guns were still playing shows in Hollywood, so Tracii and his bands were "active". 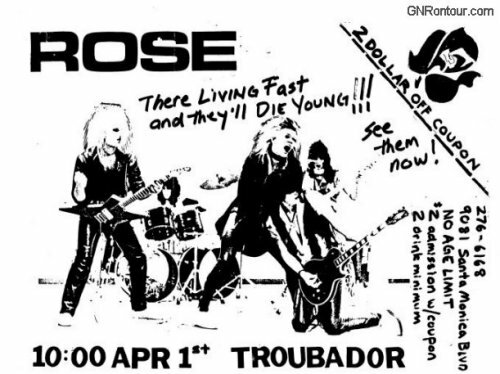 In the Raz Cue's interview video, at 1:59 mark, we see the flyer for a - so far - unknown gig that Hollywood Rose supposedly played on thursday march 7th 1985, at the Dancing Waters in San Pedro, CA, advertised on the flyer as "the band that refuses to die". This show I think its crucial in what will then become the first GNR line up. I guess this is the show that is listed in Marc Canter's book (but without a date). 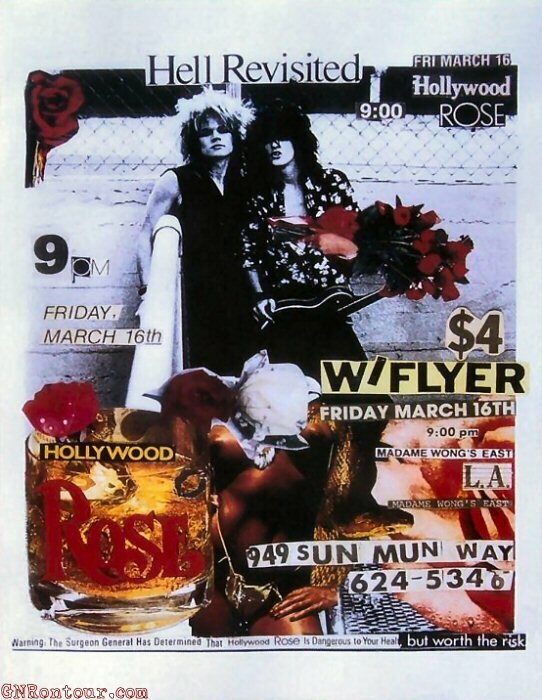 According to Marc Canter's book, Izzy, that had just left London and was looking for a band, booked this show and put up this line up comprising of various member of Hollywood Rose and L.A. Guns. This show also marked the premiere of Don't Cry. Very soon after this gig, something happened and L.A. Guns and Hollywood Rose finally merge in the first line up of Guns N' Roses, with Axl and Izzy (from Hollywood Rose), Tracii Guns, Ole Beich and Rob Gardner (from L.A. Guns – although, as we've seen above, Rob already played a gig with HR). 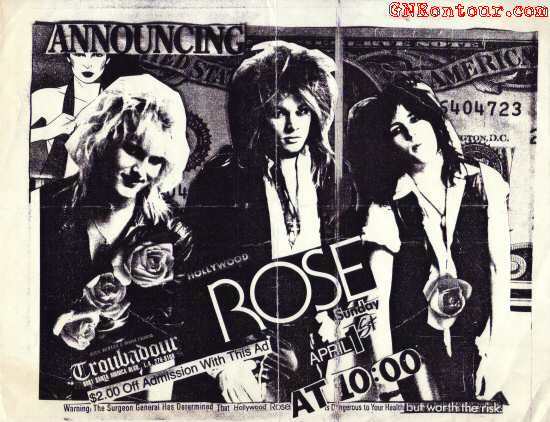 Their first gig is scheduled for march 26th at the troubadour (we learn from their very first interview, done on the night between march 21st and march 22 on KPFK in Hollywood, that this show was booked as a L.A.Guns show and then changed to a Guns N' Roses one). Ole Beich is advertised on the flyer for the march 26th show but actually he will never play live with the band as, being ready to record a rehearsal to air during the aforementioned interview, the band couldnt get hold of Ole, and Izzy decided to call a neighbor of his called Duff – who, by the way, had already crossed path with Slash and Steven a couple years before in RoadCrew). So this first interview was recorded just hours after the band recorded early versions of the songs "Think About You", "Don't Cry", "Anything Goes" (apparently Heartbreak Hotel was recorded too) at Willie Basse's studio. This recording exists and in the hands of Raz Cue. notes: apparently there was an argument over a certain Michelle Young (of My Michelle's fame) not being put on a guest list by Tracii. That drove Axl mad at him! Apparently Axl had issues with Tracii and wanted to fire him after the timbers clubs show, but waited cause they had two more shows booked, but then he fired him right after the Joshua's Parlour show in may! Rob Gardner, being loyal to his friend and bandmate Tracii, left the group soon after! At this point Axl already knew he wanted to get Slash in the band, but he was playing with Black Sheep, a somehow more established metal band on their way to getting signed. Things get confusing now, as according to Marc Canter's book, Axl, Izzy and Steven went to see Black Sheep at the Country Club on may 31st 1985, trying to convinve Slash to join GNR. That would mean Steven joined the band before Slash, although any other accounts suggests either the opposite or that they joined together! 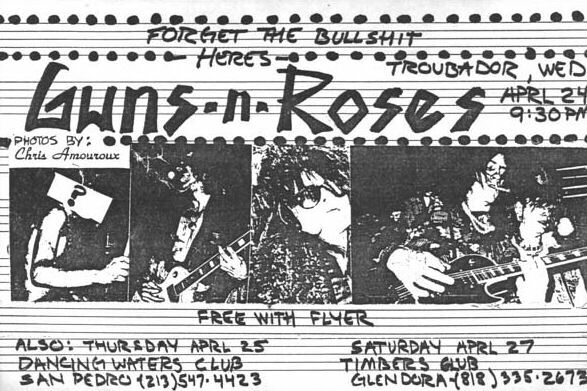 notes: This is the first Guns N' Roses gig that included Slash & Steven. They joined the band on this date. Tracii Guns & Rob Gardener are in the flyer for this show! Marc Canter should have audio recordings of this historical first show! Great post @nikki9 ! I would also add that Ole Beich almost became a member of Black Sheep, as he jammed with both Slash and Steven until they joined GN'R. 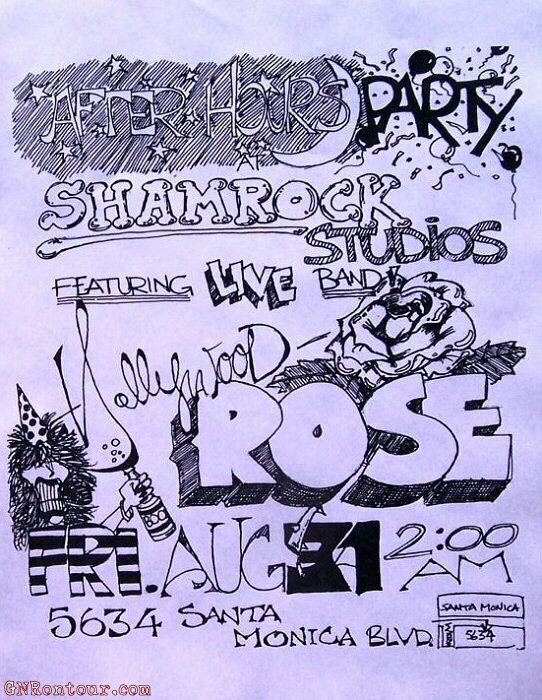 I suppose Slash left Hollywood Rose (and auditioned for Poison) after having a falling out with Axl. We know they did at some time. I agree it doesn't make much sense that Axl and Tracii would form GN'R if the reason Axl quit LA Guns was because of problems with Tracii. More likely the problem stemmed with Raz, or Axl and Tracii had musical differences in La Guns but wanted to found a label together called Guns N' Roses. I find the former explanation more plausible, though. The two GN'R dates in May 1985 are new to me. What is your source for these? Watch the KPFK interview video, at the 1:46 mark! And at 2:07 you can see a flyer for May 12! Also, Raz talks about these gigs in the interview he did recently on GN'R Central! Yes, absulutely right! Btw I'm working on a more detailed, accurate and expanded version of this timeline and I will post it asap! Wait, so according to Raz, Izzy and Axl wrote songs for LA Guns. Does anyone know what those songs were? Also, its not true that Axl Rose's first L.A. show was on january 1984, as stated on Marc Canter's book and from common knowledge on many websites. There's proofs - i.e. photo evidence - that Axl played at least one show with Rapidfire at Gazzarri's, and that ough to be 1983! notes: band is ''Bill Bailey'' (vocals), Kevin Lawrence guitar], Chuck Gordon (drums) Mike Hammernik (bass). Won ''Battle of the Bands''. notes: Izzy turned up and poached Axl at this show. Both Axl and Izzy were wearing ''glam regalia'' so the writing was on the wall! Izzy played in all sorts of bands in California also, including a drag act! Duff played for a lot of punk bands in Seattle before moving to California, drums, guitar or bass. It would be virtually impossible to figure all of this out. also because their demo -that later resurfaced as Ready To Rumble EP- was recorded on may 25 1983, as I reckon....so its more likely that the band would be active around that time and not a year later, don't you think? Oh sorry, that is all 1983. I pasted the above poster's list to follow his formatting and forgot to amend the years. The source is this big article which Kevin Lawrence put on the net when he was in a legal wrangle with Axl to get the recording released. It is all very confusing! I wish that they would've released the planned EP in 1985.
it is. I've noticed that Chris was back with them on the March 7th show, but that doesn't fit his quote that "he was back with them for a show about 6 months after he left" - if I get the timeline right, Chris' last show with HR was April 20th 1984. then he was replaced by Slash. @nikki9 wrote above some info about the December 31st 1984 show but I think that Tracii was there as lead guitarist. weird history. anyway, the only point in time when I'm REALLY unsure is, when AXL/Rose/Hollywood Rose was actually formed. it seems certain that the demo tracks later used for The Roots album were recorded in January 1984 (the booklet confirms it) and is also confirmed by the fact that the original tapes were at some point leaked by Rick Mars, who was the first bassist in January 1984 - so that's certain. Rose was in Rapid Fire until 28th May 1983. You need to find that Rapid Fire article written by the lawyer of Kevin Lawrence. I cannot find it anywhere but from memory Izzy turned up for the last show, both Izzy and Axl in glam regalia, and it was obvious Rose was going to quit Rapid Fire and the two of them were going to form a band. Didn't Slash audition for Poison in or around March '85 ? Why would he leave Hollywood Rose to audition for Poison, if there were months between ? 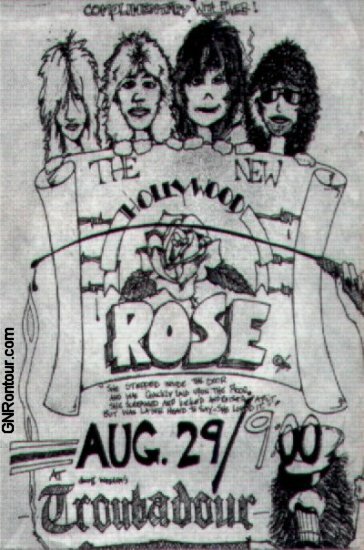 that matches quite well into the timeline - after the Aug 31st 1984 show Hollywood Rose disbands, Axl goes to L.A. Guns and Slash goes for Black Sheep and also auditioning for Poison at one point - and the two only met again in a band in the Jun 06 1985 GNR show (or somewhat earlier of course, like late April 1985).